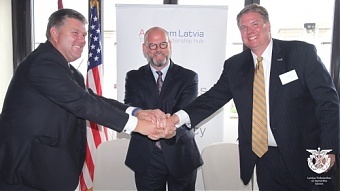 The Latvian Chamber of Commerce and Industry (LCCI) on Tuesday, July 3, signed a cooperation agreement with the American Chamber of Commerce in Latvia (AmCham Latvia) and the Latvian American Chamber of Commerce (LACC) in order to promote investment and trade between the two countries, LETA was told at the LCCI. The LCCI noted that in 2016 the LCCI together with the AmCham Latvia launched Gateway to the USA program with the aim to develop and expand mutual business ties and promote contacts between Latvian companies and American business representatives. The involvement of the third partner, the Latvian American Chamber of Commerce, which operates mainly in the US, is expected to help attract more new participants to the cooperation program. The LCCI said that the cooperation between the organizations is backed by the Latvian Economics Ministry and the US Embassy in Riga, whose representatives participated in the agreement’s signing ceremony along with LCCI board member Andris Vanags, AmCham Latvia President Arnis Kakulis and LACC President Mikus Kins. US Embassy Deputy Chief of Mission Paul Poletes greeted the parties on signing the tripartite memorandum, saying that it will help strengthen economic cooperation between Latvia and the US. Economics Ministry State Secretary Eriks Eglitis noted trade between Latvia and the US significantly increased last year thanks to Latvia’s reopened economic representation but that there is a huge potential for further growth. “I am calling on all partners to work together to double the current trade volume in the following year,” he said. Latvian Chamber of Commerce and Industry is the biggest association of entrepreneurs in Latvia uniting more than 2500 members – micro, small, medium and large enterprises of all regions and industries, associations, city business clubs and other unions of entrepreneurs. Association represents interests of entrepreneurs, as well as provides services, so that Latvia has excellent enterprises in an excellent business environment. Main sectors of its activities are business environment, competitiveness of enterprises, export. Founded in March 1993 by 27 American investors, AmCham is the leading foreign business organization in Latvia, representing over 150 members that include some of the largest international companies in the country. The Latvian American Chamber of Commerce, established in 2017 in Chicago, US, is the first organization founded in the US to represent interests of Latvian businesses. The LACC aims to promote Latvian businesses in the US and cooperation between diaspora Latvians and entrepreneurs in Latvia.